I won a Facebook contest for a dozen English Muffins. I know this sounds completely batty, and in a way, it is. Chronicle Books is a savvy company, and they know that if they put a photo of delicious food in their feed and tell you that you can win it by entering the contest… someone will enter. I am that someone, and also lucky. 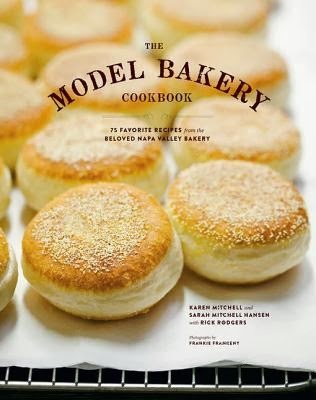 One dozen English Muffins from the Model Bakery showed up on my doorstep this Monday, and a copy of The Model Bakery Cookbook by Karen Mitchell, Sarah Mitchell Hansen and Rick Rodgers followed yesterday. I didn’t realize the cookbook was coming too, but I’m glad it did. I am not the sort of person who turns down cookbooks. Especially ones that focus on baking. This definitive baking guide is the much-anticipated cookbook from the Model Bakery, a mother-daughter-run baking destination with a huge local following that's been wowing the Wine Country for years. And this book of sensational artisan baked goods makes clear why there are lines out the door! Featuring 75 recipes and 60 photos, it's as luscious to look at as their most-requested breads, classic desserts, and fresh pastries--all arrayed here--are to eat. Pain au Levain, Sticky Buns, Peach Streusel Pie, Ginger Molasses Cookies, and many more glorious recipes make this a mouthwatering read and a reference gem for lovers of bread and pastry, cakes and cookies, and, of course, the Model Bakery! 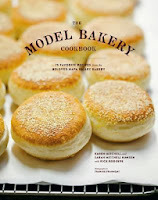 The Model Bakery Cookbook begins with the story of how Karen Mitchell took over the bakery in St. Helena in the middle of California Wine Country, and with her daughter transformed it into what it is today – a two-location baking supplier for the local area, including businesses and restaurants in addition to their retail locations. The photos by Frankie Frankeny are mouth-wateringly beautiful, and the mix of history and baking guide make this cookbook a must-see for the serious home baker. The book is divided into several sections, according to what the bakery produces (recipes reduced to home baking proportions, of course). There are several recipes listed under each section: breads, yeasted sweets, breakfast favorites, cakes, pies and tarts, and cookies. The recipes are a mix of traditional American favorites and European-influenced imports, but all should be familiar to an American audience – they’re the kind of thing you find in your local bakery. I, for instance, made the Irish Soda Bread to test the recipe, and I can report that it’s a solid, no frills approach to the seasonal favorite. The best things about the cookbook are the great ingredient & equipment advice (I’ll be taking notes when pie-season arrives… basically, in a week or two! ), an array of delicious recipes ranging from simple to difficult-to-replicate-at-home, lovely photos – some offering step-by-step visuals for the items requiring assembly, local and historical anecdotes of both the Hansens’ story and the location in St. Helena, and classic recipes done to perfection. I had few quibbles with the cookbook, and they are minor. The first is the small type used for instructions portion of each page. I have good eyes, but if I didn’t it would require bending very close to the page, which is not necessarily something you want to be doing with floured hands. The tips on the ingredients and tools also make it clear that this is not a cookbook for the frugal baker. While I agree with the writers that the best food comes from the best ingredients, it isn’t an inexpensive proposition, especially if you count some of the specialty flour and chocolate mentioned. Finally, you won’t find any truly unique items (so don’t go in expecting them!). This baking book is about the classics, and they done very well. In all, I’m glad to have this cookbook – it’ll work perfectly as a reference guide alongside my Joy of Cooking, and I intend to dip into it for holiday baking ideas as well. And if I scrape up the cash to get a stand mixer in the near future, I know I’ll be consulting these recipes again and again. Recommended for: the intermediate home baker, anyone who enjoys playing in the kitchen and is planning a trip to Napa in the future, and as a primer for favorite/standard American baked goods. Interested in other food-related recipes? Check out Beth Fish Reads' Weekend Cooking! Fine print: I received a finished copy of The Model Bakery Cookbook from Chronicle Books as a contest prize. I didn’t get paid for this post, and I chose to write the review of my own volition (it was not required or suggested). Soda Bread! Also, how were the English muffins? Liviania: Oh, good question! They were delicious! Much larger than I'm used to, so I used them for sandwiches rather than with butter & jam, as I would normal English Muffins. And I had to give away half of them, because what is one person going to do with a dozen?! What fun to win a cookbook, too! I know what you mean about the specialty ingredients. I'm going to start experimenting with gluten-free baking for the holidays and the specialty flours are very expensive! Congratulations on your big win! I have always wanted to visit wine country, maybe I should start with this. Great win. I appreciate your comments about the fine type print. My eyes aren't what they used to be and I have trouble with smallish print. Sounds like a great book overall and I like the soda bread! English muffins and a surprise cookbook are terrific prizes. Looks like you made good use of them! How fun to have won both a cookbook AND something good to eat. The cookbook sounds like a good resource, especially for someone like me who probably already owns a lot of the gadgets. Don't you love awesome surprises like this one? Sounds like a great cookbook--I'm a sucker for anything that teaches how do make the basics. Though I understand about the specialty/expensive ingredients! I also get annoyed when I can't find the ingredients at my regular grocery store. Enjoy the baking! And maybe Santa will bring you that stand mixer? Winning is always fun. and a dozen English muffins even better.